Am fear a b’oige a tha a gabhail pàirt anns am film, ach aig an aon àm am fear aig a bheil, cha mhòr, a phàirt as motha, ‘s e seo a chiad uair a tha Padruig air cleasaidheachd a dhèanamh ann am film. Tha e gu math dealasach mu bhi a cluich agus ag èisteachd ri ceòl traidiseanta (tha e ri fhaicinn a cluich a bhogsa san fhilm) agus bi e a fuireach ann an Griomasaidh ann an Uibhist a’ Tuath le a phàrantan. The youngest member of the cast, and yet arguably the one upon which the emotional weight of the film rests, this is Padruig's first acting role. He is a keen fan of both playing and listening to Scottish traditional music (he can be seen playing the accordion in the film), and lives at home in Grimsay in North Uist with his parents. Ri fhaicinn an seo, anns a phàirt a chluich e an toiseach airson am film goirid Foighidinn, tha Aonghas Pàdraig Caimbeul na bard, sgrìobhadair leabhraichean, neach-naidheachd, craoladair agus a nis actair, gu math cliùiteach. As deidh a dhachaigh ann an Uibhist a’ Deas fhagail airson Àrd-Sgoil an Obain, far an do ghabh e ùidh ann an litreachas fo stiùir an neach-teagaisg aige, Iain Mac a’ Ghobhainn. Bha e a nuair sin fortanach, aig Oilthigh Dhùn Eideann, misneachd mhòr fhaighinn a thaobh a sgrìobhadh aige bho Shomhairle MacGill-Eain, a bha na Sgrìobhaiche aig an Oilthigh aig an àm. Dh’obraich e ann an naidheachdas agus craoladaireachd airson iomadh bliadhna agus chur e a mach da chruinneachadh de bhàrdachd agus da nobhail. Bha a chiad dhiubh seo, An Oidhche Mus Do Sheol Sinn, air a bhotadh a staigh dhan an 8mh àite nuair a dh’fhaighnich The List airson na 100 leabhraichean Albannachadh a chaidh a sgrìobhadh riamh agus bha an dara dhiubh air fhoillseachadh ann an 2004. Tha e a-nis na sgrìobhadair lan-uine agus bi e a fuireach ann an Slèite san t-Eilean Sgitheanach. 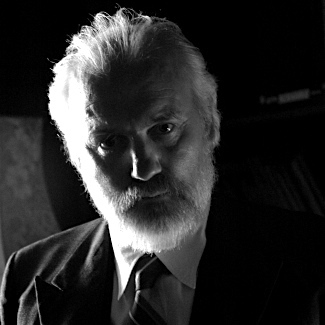 To be seen here reprising his role from the short film Foighidinn (The Crimson Snowdrop), Angus Peter Campbell is a renowned poet, novelist, journalist, broadcaster and now actor. Leaving his home in South Uist to attend High School in Oban, he developed a keen interest in literature under the expert guidance of his English teacher, Iain Crichton Smith and was then fortunate enough, when at the University of Edinburgh, to be further encouraged by Sorley MacLean who held the post of Writer in Residence there at the time. A distinguished career in journalism and broadcasting followed and he worked for both the BBC and Grampian Television. He has released two collections of poetry and two novels. The first of those to be released, An Oidhche Mus Do Sheol Sinn (The Night Before We Sailed), was voted eighth in a poll of the 100 Greatest Scottish Books Ever conducted by The List Magazine; his second, Là a' Deanamh Sgeil Do Là (Day Speaketh Unto Day) was published in 2004. He released Invisible Islands, his first work of English fiction, in 2006. He is now a full time writer and lives in Sleat on the Isle of Skye with his wife and their six children. Se Sgitheanach a th’ann an Colla, a bha air a thaghadh airson a charactair Aonghas (Padruig Moireasdan) a chluich nuair a tha e na bu shine. Tha e tric ri fhaicinn a cluich an fhidheall aige air feadh Alba agus bi e a cluich anns a chòmhlann Harris Tweed Brogues. Tha e a nis na oileanach air cursa-chiùil colaisde Beinn a’ Bhaoghla. Coll is a native of the Isle of Skye and was selected for the challenging role of portraying Padruig Morrison's Angus as a young man. He is a well-known fiddler on the local scene, plays with the ceilidh band Harris Tweed Brogues and is now studying music at college in Benbecula in the Western Isles. 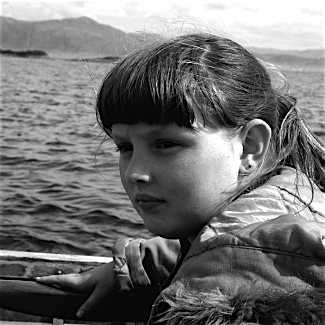 When casting for the children's roles in the film, the producer and director did not have far to look with 3 of the children (Christopher MacDonald, Winnie Brook Young & Isabel Macrae) coming from the local Sleat Primary School, and Sleat local Annie MacLeod from the island's Portree High School. It was new experience for all and one that they very much relished. Gàidhlig ri thighinn. ‘S ann mar bancair air Wall Street le J P Morgan a thoisich an sgrìobhadair agus stiùiriche Simon Miller. As dèidh sin bha e na ghnìomhaiche ann an saoghal ceòl Breatainn, far an do chuidich e le a bhi a toiseachadh agus a nuair sin a reic Peoplesound.com, a chompanaidh ceòl digiteach as motha anns an Roinn Eòrpa. Ann an 2002 thoisich Simon as ùr ann an saoghal film le a bhi na oileanach aig Sgoil Film Lunnainn agus an National Film & Television School. Chaidh a chiad film aige, film goirid, dubh & geal, gun fuaim agus air an ro an ainm Windfall a shealltainn airson a chiad uair aig feis film Clermont Ferrand. Bhon àm sin, tha e air 4 filmichean goirid a chur a mach, nam measg Foighidinn a chaidh a shealltainn air a BhBC ann an 2005 agus a bha ri fhaicinn aig feis filmichean air feadh an t-saoghal agus a bhuannaich duais airson am film goirid as fhearr aig feis film Bermuda. Film writer and director, Simon Miller, was previously a Wall Street investment banker and music industry executive before seeing the light. In 2002 he retrained into the Film Industry at London Film School and the National Film & Television School. 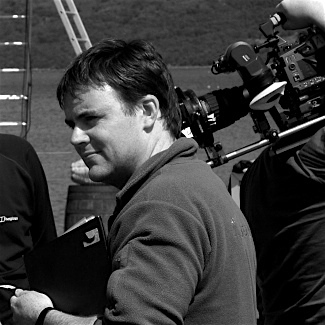 His first short film, Dead Man Falls, premiered at the Edinburgh International Film Festival in 2004 and his second, Foighidinn - The Crimson Snowdrop, premiered on the BBC in 2005 and went on to show at festivals around the world winning best short film at the Bermuda International Film Festival. Seachd - The Inaccessible Pinnacle is Simon's first feature film. Tha Joanna Cockwell ag obair mar neach lagha ann an Lunnainn a bharrachd air a bhi a sgrìobhadh agus a dealbhachadh. Bi i a sgrìobhadh le, agus thoisich I a chompanaidh film Dead Man’s Shoes le, a chaidreach aice Simon Miller. Joanne Cockwell is a writer and illustrator from Hampshire, UK. She set up the film company Dead Man's Shoes with partner Simon Miller; they write feature film scripts together. Tha Iain F MacLeòid iomraiteach mar sgrìobhadair ann an Gàidhlig agus Beurla airson dealbhan-cluiche agus an telebhisean. Tha na dealbhan-cluiche aige air a bhi ri fhaicinn ann an New York agus Lunnainn agus o chionn ghoirid sgrìobh e an dealbh-cluich soirbheachail, I Was a Beautiful Day, airson an Traverse Theatre ann an Dùn Eideann. Bha a chiad leabhar aige, The Klondykers, air fhoillseachadh ann an 2005 air telebhisean tha e air phrògraman a stiùireadh airson an t-sreath ealain Ealtainn, agus chaidh Something About Harry, an aithris a rinn e air beatha Harry Lauder a shealltainn air BBC2. Iain Finlay MacLeòid is a well-known writer and director in Gaelic and English for both the theatre and television. He has had his plays performed in New York and London and the Traverse Theatre in Edinburgh commissioned the recently successful I was A Beautiful Day. His first full-length novel, The Klondykers, was launched at the Edinburgh Book Festival 2005 and recent directing credits have included a contribution to the Gaelic Arts series Ealtainn and Something About Harry, a documentary on the life of Harry Lauder for BBC2. Tha Ishbel T Dòmhnallach air an t-uamhas a sgrìobhadh airson telebhisean agus an rèidio, gu h-àraidh drama chloinne airson a BhBC. Tha i cuideachd iomraiteach airson a sgrìobhadh òrain, mòran salm Ghàidhlig nam measg. Ishbel T MacDonald has written extensively for radio and television and in particular for the BBC in the area of children's drama. She is also well known for her songwriting and her lyric writing, including many well-known Gaelic psalms. Tha Aonghas MacNeacail na bard agus sgrìobhadair agus dh’obraich e air am film Gaidhlig Hero a bha a measg na chiad filmichean a rinn sianal 4. Tha e cuideachd air sgrìobhadh a dhèanamh airson Machair agus iomadach aithris, dealbh-cluich agus libretto. A bharrachd air seo, sgriobh e An Iobairt, film goirid a fhuair urram aig feis filmichean goirid Palm Springs. Aonghas MacNeacail is an award-winning Gaelic poet and writer. He was the translator and language consultant on Hero, one of the first Channel 4 film commissions, and has written for the Gaelic Soap, Machair as well as for a number of documentaries, radio plays and librettos. He also scripted the short film An Iobairt (The Sacrifice), which received an honourable mention at the Palm Springs International Short Film festival. Air a bhreith ann an Dun Eideann ann an 1960, dh’fhag Christopher Young Alba airson a bhi na oileanach aig Oxford mus deach e a theagaisg ann an Paris (Lycee Henri IV) agus a nuair sin air ais dhachaigh airson a bhi na Scottish Film Trainee. Ghabe e dioploma ann an a bhi a riochdachadh filmaichean ann an NYU ‘s na Staitean, mus do thoisich e mar deasaiche ann am Breatainn. Chaidh Young Films a steidheachadh ann an 1986 airson filmichean a leasachadh agus a riochdachadh agus tha a chompanaidh a nis ri lorg anns an t-Eilean Sgitheanach. Riochdaich e filmichean a leithid Venus Peter, Gregory’s Two Girls, agus Festival a bhuannaich British Comedy Award airson am film as fhèarr agus a chaidh a chur air adhart mar am film Breatannaich as fhèarr aig na BAFTA’s.